Throughout my life I’ve been something of a serial hobbyist, with a tendency to pursue a hobby obsessively until I burn out on it, or at least until the flame starts to cool. Over the years I’ve tackled ham radio, flying airplanes, gliders, motorcycling, tournament bridge, and astronomy. I was deeply involved in organized bridge for several years. I directed games at the San Jose Bridge Center, traveled to tournaments, and taught a couple hundred students to play the game. I was even president of our local bridge unit for two years. In 2000 I finally achieved “Life Master” rank in the American Contract Bridge League, and hung up my cards. I didn’t make Life Master quickly. For one thing, I was never a bridge prodigy, just a reasonably smart guy who enjoyed playing the game. I was also so busy teaching and directing I didn’t get to actually play cards as often as I might have. But why walk away from it? Why abandon the game I was so deeply involved with for so long? For one thing, of course, there were plenty of life changes, job changes, my lovely new wife Jane, moving from Campbell to Marin and then Los Angeles. Astronomy had become the newest passion to get most of my attention, and I’m still enjoying that. I can also honestly say that I didn’t miss bridge. Competitive bridge can have an unpleasant dark side. I’ll never forget stepping into a hallway at the North American Bridge Championships to see a red-faced player berating his partner loudly and mercilessly. As a director I was often asked to rule on a judgment call against players whose bridge experience certainly far exceeded mine, and often enough there were arguments and confrontation. I’m not an argumentative person, and confrontations like that could leave me sleepless for a day. All along I knew that bridge would still be there when I was ready for it. 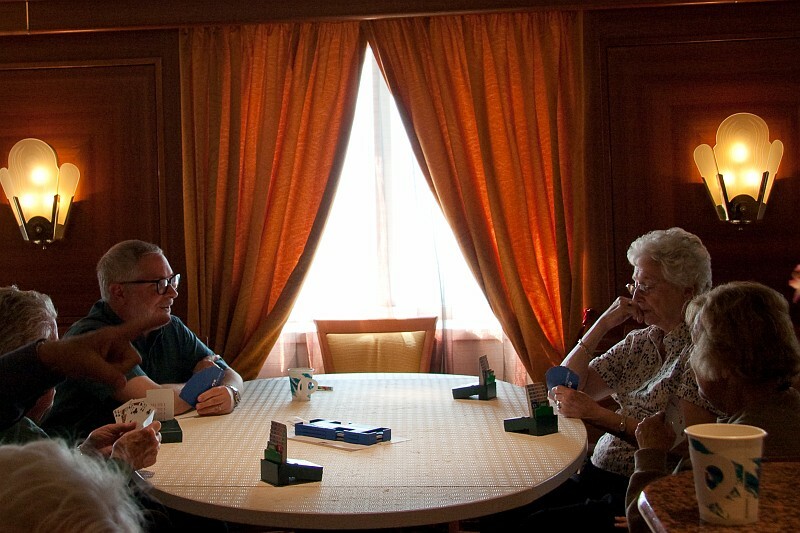 In June I took my first cruise with Jane and her family on the Sea Princess to Alaska. Bridge is a classic cruise activity, and Englishman John Beard was an entertaining and congenial teacher and director. I played five sessions of duplicate with a delightful lady from Texas who was really kind of hopeless at bridge. This past weekend, Jane was in Toronto speaking at Starfest. Rather than stay home in my pajamas playing Free Cell, I opted to go out and play bridge. I kibitzed a few hands on a Thursday evening at the Beverly Hills bridge club tucked into what looked like a former storeroom in a community center. I dropped in on the Arcadia Bridge Center on Friday, and played in a North American Pairs qualifying match. Patrick Cardullo and I qualified for the Flights A and B unit final with a second-place finish. I played a fun club game on Saturday with Tom Miyake, and made plans to meet him on Sunday for a unit swiss team game in San Marino. On Sunday we played with pick-up teammates and took second overall out of 18 teams. I won my first masterpoints in nine years, and had a blast. In all those dozens of bridge hands, there wasn’t a single unpleasant moment. In my return, I was reminded of what I love about organized bridge. First there’s the game itself: the thrill of watching your partner execute a perfect end-play to make a doubled contract, recognizing a squeeze play as it develops and executing it, and the unforgiving and humbling nature of the game when you make a small mistake. Then there are the people who play the game. During my weekend binge every player I met was interesting, delightful, and gracious. Bridge players come from all walks of life. They are smart and tend to be eccentric. The best players enjoy the inevitable humor in the endless patterns and chaos of the card deals, along with the foibles and misunderstandings. Yes, there is ego and intimidation in bridge, as in any competitive sport, but fortunately it’s rare. The best players in competitive bridge will have you smiling and enjoying every minute while they’re beating your pants off. That for me is the joy of bridge. I love your bit of history.. I am playing duplicate on my 79th year and enjoying it immensely. I have been teaching party bridge at the senior center in Milpitas California.